After saying goodbye to Easter visitors I was suddenly on my own and the house felt very quiet. I thought about the horrible job ahead stripping all the beds and decided to make a start. I glanced out the bedroom window and couldnt believe the size of the bird that had landed on the fence between me and my neighbour. 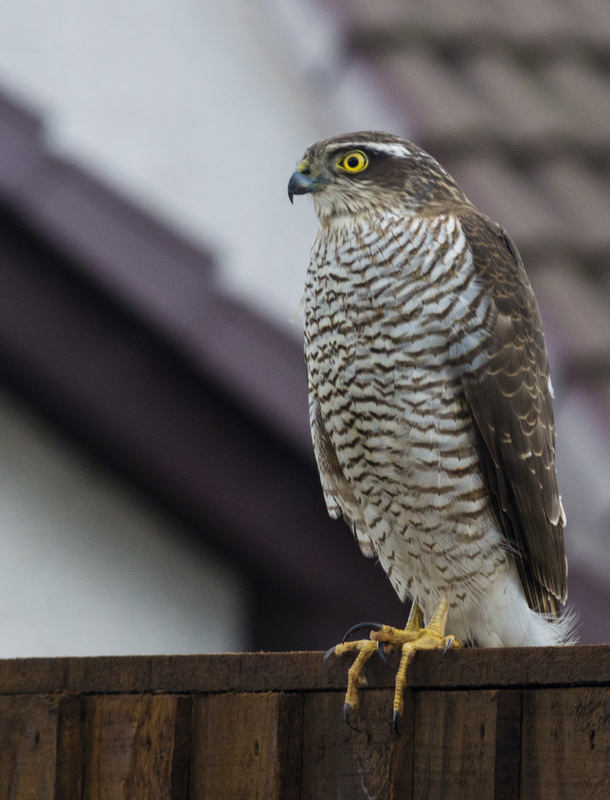 I grabbed my camera and very quickly picked the aperture I wanted.I opened the back door very slowly and stuck the camera outside and managed to capture the sparrowhawk. I then got a bit braver and very slowly sidled out of the door and got an even better, closer shot. My neighbour then came out of his door and the hawk flew away.I had my Nikon 70-200m lens on and was in aperture priority. I decided to be brave and shoot this in camera raw, doing very little post processing.